How can somebody say “I can’t do it” after watching the following video? Bad luck, the timing wasn’t correct, our bank pulled the plug on the business, our competitors undercut us, our suppliers failed to keep up with the demand, the customer didn’t understand our offering, product quality issues, the demand for the product just dried up, wrong location, wrong business model. Interestingly, there's no use of words I, Me or We. It does not have to be financial success. It might be about anything: relationships, sports, family… you name it. After watching this amazing woman below, you will stop blaming bad luck for being unsuccessful. Manami Ito, a Paralympic swimmer, is playing violin with her prosthetic arm. She had lost her right arm in a traffic accident in November 2004, when she used to study to become a nurse. That forced her to abandon her career. Nevertheless, when she went to a facility to get her artificial arm, she was stunned by people with a disability playing basketball. Since then, she began swimming and returned to study again to become a nurse. Manami Ito is a violinist, a nurse, and a Paralympian swimmer. She came in fourth in the 100m Breaststroke at the 2008 Beijing Paralympics and eighth at the 2012 London Paralympics. 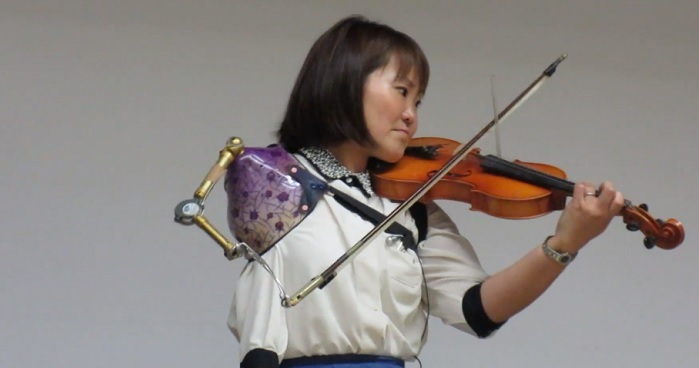 She's also the first nurse to have a prosthetic arm in Japan and shares her violin performances around the country. In the popular Facebook video below, she plays Thread by Miyuki Nakajima. Kazushige Masuda captured her performance on September 2, 2018, at the Takarazuka City General Welfare Center in Hyōgo Prefecture, Japan.